Views expressed here are solely that of my own. Please make sure that you test the code/queries that appear on my blog before applying them to the production environment. 3) List of all Database Background Processes by category. Click here to read more about it and click here to download it. 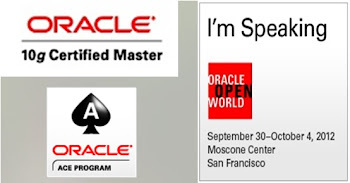 I am Oracle Certified Master (OCM) - 10g & OCP 11g/10g Database and OCP 9i Forms Developer certifications. I have more than 14 years of experience in Oracle Database and Developer Tools. I am working as a Principal Technology Consultant at Oracle.